Protect your company from fraud by recording non-customer's fingerprints directly on checks and other documents. 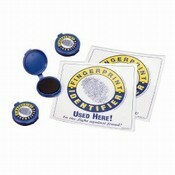 Fingerprint Identifier makes a permanent no-smearing record on any paper stock. Inks is easily removed from fingers by rubbing them together. A pressure-sensitive patch on the bottom of the pad holds it to a counter or desk. Each pack includes three 500-print pads and two window decals.